As more and more devices are being designed with inherent intelligence and the ability to connect and communicate, the amount and complexity of electronic content is continuously increasing for our industrial customers. They need the ability to quickly and efficiently verify proper operation of these products as they flow off the production line. Circuit Check responds to these needs by offering a wide range of industrial electronics testing solutions from consulting to complete test system and software design. We also offer adaptable support solutions to ensure proper equipment operation throughout its life cycle. Our industrial customers need a test solutions partner to help solve some of the most complex test challenges. Circuit Check partners with these organizations to eliminate potential test risks and ensure the test system is built with the highest quality and reliability. We provide end to end electrical design, software development and verification of each test system we build. Our robust test systems can withstand the high volume production requirements of the industrial market. Our customer’s need a test system that will last and withstand hundreds of thousands of test runs. 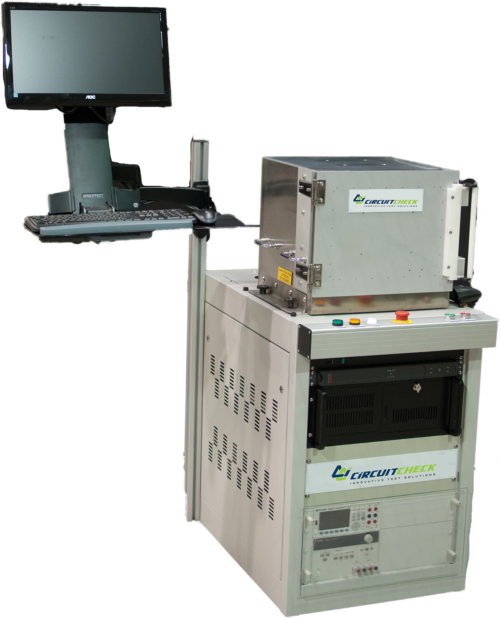 Circuit Check’s design quality and durability allows our customers to meet their cost-effective testing goals. Circuit Check can easily pin point excessive strain on any of the model’s surfaces and offer solutions to correct the issues. Providing finite element analysis results allows for precise changes to the fixture during the engineering process, resulting in a reduced amount of strain applied to the PCB. Similarly, strain gauge testing allows Circuit Check to reduce the strain on the product under test. Circuit Check specializes in reviewing documentation packages of existing systems and will provide updates for release to our customer’s document control center. In addition, Circuit Check maintains documentation to build additional test systems and fixtures for increased manufacturing capacity.